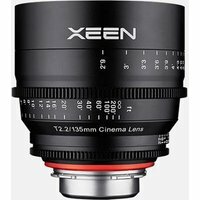 Suitable for EF and EF-S mount Canon cameras, the Samyang 135mm T2.2 XEEN Cine Lens is a fast telephoto lens that joins Samyangs XEEN cinema series. Featuring X-Coating Technology, this lens delivers outstanding optical performance for 4K+ video. Its bright T2.2 aperture offers high-quality footage with clear contrast, impressive colours, and pleasing bokeh effects even in low lighting.